!! OMG, hosted by Gus Kenworthy meme-ing what we were all already thinking at the MuchVMAs !! A bajjillion male pannies just exploded! Olympian Gus Kenworthy knows his market! And it ain’t people who follow sports! 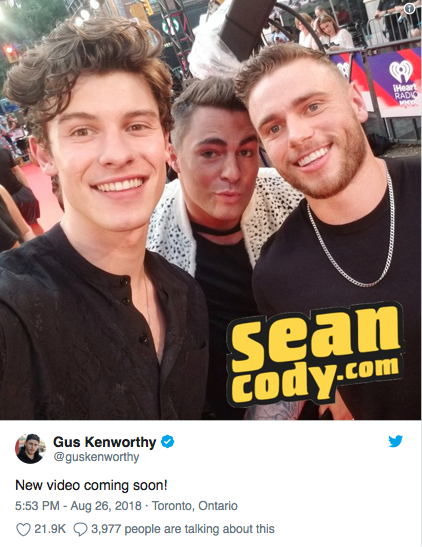 Check out Gus’ winking tweet from the MuchVMAS last night featuring Shawn Mendes and Colton Haynes! How long had he been waiting to do that!? 7 Comments on "OMG, hosted by Gus Kenworthy meme-ing what we were all already thinking at the MuchVMAs"
I thought Shawn likes Black peen…. Gus is cute, Shawn is GAY 100% and Colton…mess. Three bottoms enter! One Mendes leaves Thunderdome with a smile on his face! Just smile. You ruined an otherwise beautiful picture. He is not looking his finest..